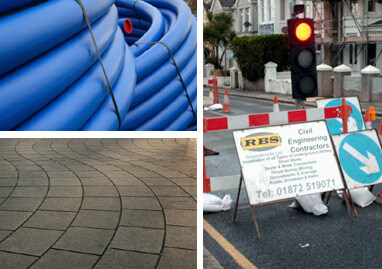 RBS Groundworks Limited are a well established groundworks contractor serving Cornwall and surrounding areas. With a successful track record of delivering both public and private sector projects, RBS Groundworks Ltd credentials and qualifications speak for themselves. Accredited with CSCS qualifications and ISO 9001:2000 quality assurance certification, the work force of RBS Groundworks Ltd are all professionally trained and qualified to these high standards and the work we produce echoes this. We offer a complete range of groundwork services, competently fulfilling a number of disciplines including Drainage, Sewer Connections, Thrust Boring, Duct & Cable Laying, Tarmac & Road Construction to name a few. Being an accredited Street Works contractor means we can undertake and oversee all aspects of road works which can save the client time and money. RBS Groundworks Ltd have a proven track record and strong relationship with it's clients in both the public and private sectors, our clients include British Telecom, NHS, Cornwall Council, McAlpine & Carillion.